The MEs were built by Henschel in Kassel, Germany and entered traffic between 1981 and 1985. They are six-axle, 175 kph (109 mph), 3,300hp diesel-electrics with 16-cylinder General Motors 645-series power units. DSB had identified a need for high-powered, high-speed diesel locos for use east of the Storebælt. With a fleet of main line diesels (classes MX, MY and MZ) almost entirely comprising of machines built by the Swedish firm of NoHAB and fitted with General Motors power units, it would have been a simple decision for them to have gone for “more of the same”. However, they wished for the new fleet to have asynchronous motors, which was not something NoHAB were able to provide – enter the West German firm of Henschel who had experience of these with their prototype fleet of DE2500 locos. These, however, were still to be built with GM power units (not the MTUs as in the DE2500s) to retain some level of commonality across the DSB fleet. Initially, a fleet of 30 machines were procured – numbered ME 1501 to ME 1530 – and were delivered by rail, via the Puttgarden to Rødby train ferry – between June 1981 and December 1983. A subsequent order for seven more – ME 1531 to ME 1537 – arrived between March and November 1985. The MEs have been involved in their fair share of accidents – some quite horrific – although surprisingly none have been written off as a result of them. One of the first to occur was at Hvidovre on 11th March 1986, when ME 1507 ran through a stop block and down an embankment, onto a road (link to a photo here). The investigation concluded that the driver, who died in the accident, had passed a signal at danger. A significant accident in Danish railway history occurred on 25th April 1988 at Sorø, when a train hauled by ME 1535 derailed at speed (link to a 28-minute documentary, in Danish, here). 8 people died. This accident is largely credited with forcing through the development of automatic train control on Danish railways, although this did not happen quickly. 25th September 1992 saw a collision between two trains at Næstved – a freight train hauled by MZ 1446 and a passenger train hauled by ME 1511; the two locos ended up telescoping into one another (see video news article here). One of the derailed tank wagons was containing dangerous goods, which leaked, complicating the clean-up operation considerably. Another coming-together between classes ME and MZ occurred at Bråby on 14th April 1994. ME 1523 hauling a regional train towards Næstved hit a heavy freight train hauled by MZ 1442 and MZ 1439 head-on (news article here). ME 1520 was involved in a head-on collision with the push-pull driving vehicle of an approaching ME-propelled passenger train on the single line at Regstrup on the morning of 8th January 1998 (see video of the TV news footage here). 3 serious injuries resulted, but fortunately no deaths – especially fortunate when you see how poorly the driving trailer had stood up to the collision and how it had embedded itself in the cab of the ME. As I said above, all of those locos were repaired and returned to service. Nevertheless, two have been written off, but both through fire damage – ME 1510 which caught fire at Høje Taastrup on 30th November 2005, and ME 1507 which followed suit at Nørre Alslev on 18th July 2008. Aside from these, another two MEs have been stood down – ME 1502 which was withdrawn in 2013, used for spares and then cut up in 2016, and the class leader, ME 1501, which is now in the collection of the Danmarks Jernbanemuseum and is at their facility in the roundhouse at Randers. The remaining 33, however, form a common fleet used entirely on regional passenger services on a small number of routes radiating from København, east of the Storebælt. In this article, I explained how I tackled covering their workings in a day trip from the UK in March 2017. Their diagrams can be found in the members’ file section of European Rail Gen. Please may I remind you that if you benefit from using these diagrams, please post your sightings to the group! 2018 has not got off to an auspicious start for the class, with the discovery on 26th January of cracks in two ME wheelsets resulting the grounding of all 33 machines and the sending of each axle to the workshop in Aarhus for detailed examination; a process that is taking a long time as there is simply no room for all 198 ME axles to be in Aarhus at the same time. Currently, most of the fleet remain out of traffic and some of the wheelsets have been found to be write-offs, and Bombardier may not be able to supply new ones until September. A number of MEs remain in traffic (those which have been examined and signed off as OK), but currently their availability – and consequently the number that are in use each day – is considerably less than the plan requires. It should be pointed out – although without comment – that the damaged axles found in January are said in various news reports to be from ME 1532, which had failed in some style between Holbæk and Regstrup on 13th September 2017 (with an axle defect) whilst working a passenger train, and was then dumped in Roskilde for some months. One technical issue involving the MEs that is yet to receive an entirely satisfactory solution is the high concentration of diesel fumes found in the double-deck carriages that they haul. Since 2016, ME 1503 has been trialling a spoiler to tackle this, which makes it easily recognisable from its classmates. From 2002 onwards, the class were all painted into a fairly spartan blue livery. However, in the last 18 months or so, some have been painted into a new “helrød” livery – nine (ME 1504, ME 1508, ME 1514, ME 1521, ME 1528, ME 1531, ME 1533, ME 1536 and ME 1537) are known to have been so-treated to date. The future for the MEs is bleak. In 2016, DSB announced that they will be purchasing 26 new electric locomotives with the express aim of replacing the MEs from 2020. On 13th March 2018, it was revealed that these will be Siemens Vectrons. 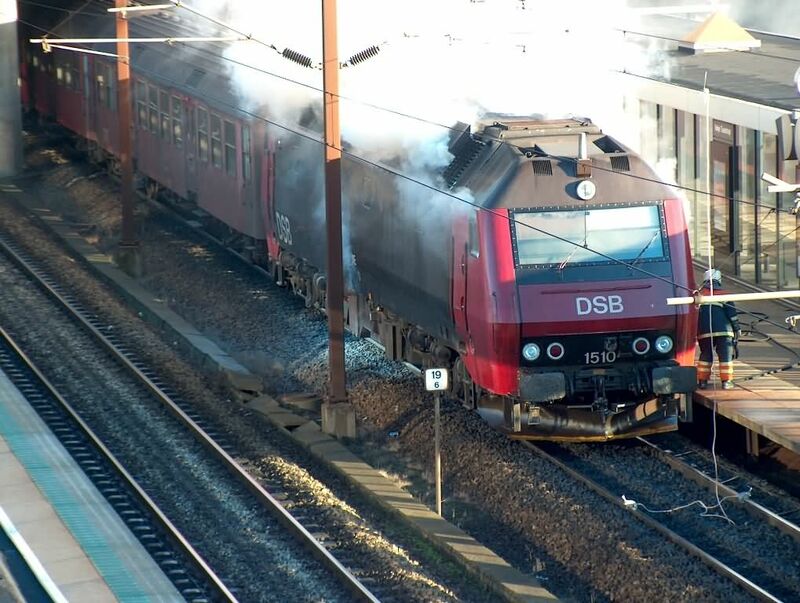 When that sad day comes, it will not only mark the end of the type in DSB service (although they may just reach the respectable milestone of 40 years in service first! ), but also the end of DSB’s use of GM diesels on front line work, a bond which dates back to the procurement of the first MY class NoHAB loco in 1954. If you haven’t already, I’d certainly recommend a trip to experience them before it is too late.